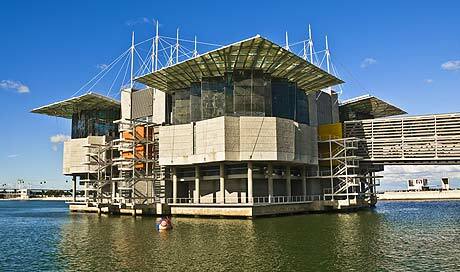 The Lisbon Oceanarium is, by far, one of the top attractions in the capital of Portugal. It is located in the splendid Parque das Nacoes, and despite the fact it does not enjoy the historical prestige of other landmarks of Lisbon, such as the Belem Tower or the Jeronimos Monastery, it remains one of the first-hand must-visits of the city. The visiting card of the Lisbon Oceanarium opens with a remarkable reference: the venue is one of the largest of its kind in Europe. But it’s not just the dimension which recommends the Oceanarium as a top tourist sight. We also speak of the way it was designed. Indeed, the Lisbon Oceanarium is one of the most paradigmatic works of Peter Chermayeff the company of which is renowned for its proficiency and excellence in the field of aquarium design. Both by force of its size and of its design, the Lisbon Oceanarium gives visitors the opportunity to learn a lost about the marine life in sundry oceanic habitats. The venue shelters some 450 species, counting thousands of specimens, and reproduces a wide range of habitats, from the tropical Indian coral reefs to the Antarctic coast. In spite of the fact the animal life asset is as impressive as it gets, the Oceanarium has often been criticized for reuniting, in an artificial manner, species which otherwise, in their natural environment, would not blend in together into the same picture, thus distorting the understanding one might get about the sea life. The Lisbon Oceanarium is also home to impressive interactive displays which inform visitors about the history and the development of the marine world. Stimulating admission discounts are granted to Lisbon Card holders.